Many newer vehicles now come with built-in sat navs, which make life so much easier. However, there are still a few people who own cars that do not have this luxury. There is now a wide range of sat nav systems available to you to meet a number of your personal needs and requirements. Here we are going to tell you all you need to know about them and the best ones you can purchase. If your thinking of purchasing a new car that has an optional extra for a sat nav there are a few things you will need to check before saying yes and handing over your hard-earned money. As an example, all new BMW models now come with built-in sat navs. Many sat navs are now built into the central control unit of the vehicle and are usually controlled through a touch screen or the buttons on the dashboard. There is a wide selection of standalone sat navs now available that are even better than those you may find in some vehicles. Navigation is one of the main things you are going to want to take into consideration. A good sat nav is going to get you to your destination as smoothly as possible without any last minute direction changes. Many of you that do not have a built-in sat nav there are other options for you. Applications are now a great way for you to get around, they are both convenient and cheap. However, some application performance can depend on the type of smartphone you have. They can also be fairly costly if you are on a limited data plans as they need to use a fair bit of your data to get you anywhere. Waze is one of the best navigation applications out there, it works based on a community which allows those driving on the same roads can update the application themselves giving the most up-to-date and real-time updates. The application works to outsmart traffic and will regularly update throughout your journey to give you the best possible route, meaning you will get to your end destination much quicker. Another great feature of Waze is you can also update drivers of where potholes are in the road, unfortunately, in Milton Keynes we experience a vast amount which is why its so important we have our BMW Service Centre in Milton Keynes completed regularly. It also has a number of other features such as Fuel stops; it provides the cheapest stations on your route, these prices are shared and often updated by the local community helping you to save money. The application is downloadable on both Google Play and the App Store. Here We Go is also another application which is also great for being fairly accurate when it comes to journey times and delays. As well as a smartphone application the software has also been sold to a number of German car brands including the likes of Audi, BMW and even Mercedes. It is a completely free application for you to download. You also have the option to download maps or take maps offline. This means you can download maps from over 150 countries and use them without needing to use the internet; you also do not have to download the whole country map if you are only travelling in one region. Google maps are one of the most common downloadable application to help navigate its users on the roads. Again it is a completely free application for you to download. Google Maps gives you up-to-date traffic with real-time estimated arrival times. A great aspect of google maps is it allows you to see the best places to visit such as restaurants around your local area. You can also see a range of reviews and ratings along with pictures of local places to visit. Stand-alone sat navs are a fantastic purchase if it is something you are going to be using on a regular basis, most sat navs range from anywhere between £50 to £300. Over recent years stand alone sat navs have dramatically reduced due to the number of applications and built-in sat navs now available. However, Garmin and TomTom continue to dominate the market accounting for a vast majority of models sold here in the UK. There is a range of benefits to having a stand alone sat nav compared to using applications. You are less likely to be distracted when using a standalone, unlike a phone, there are no options to receive messages which means you are less likely to mess around with the unit. Many come with non-reflective screens which means you can see clearly when driving. 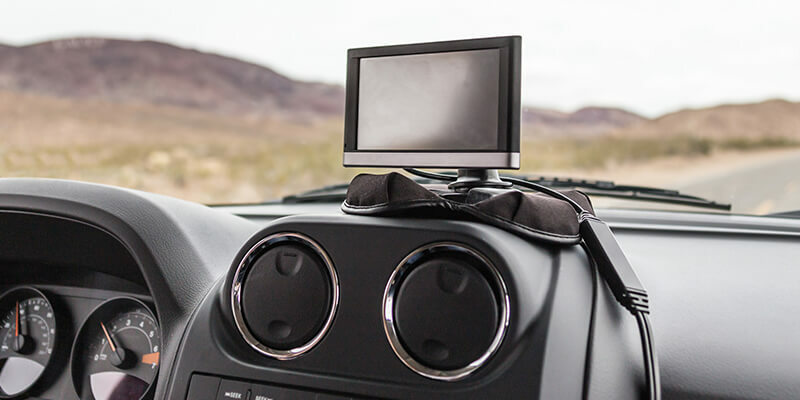 A lot of standalone navigation systems also come with free updates which while you may think you are spending more by purchasing a stand-alone saves you money in the long run. If you would like to know more about the best sat navs for under £100 we recommend taking a read of the which article on Top three best cheap sat navs for 2018. While standalone and applications are extremely handy, there are a few things you need to know about the laws surrounding your sat nav or phone. If you place your device on a certain area of your windscreen you could potentially be breaching the Highway code; it should not obstruct your view in any way. If you unsure on how to correctly use your sat nav whilst driving we highly recommend taking a read of the AA article on Ten tips to help you get the most out of you satnav. Sat navs are a great way of navigating yourself around without having to worry about looking at a paper map. Some are already built into many newer vehicles whereas older models may have to opt for either an application or standalone unit. Before going ahead with any of the sat nav options we believe you should do your research, find out how it works, how up to date it is and how much it cost to get regular updates on your maps.